Half-baths are a little like the middle child of any family. They don't have the robust qualities that make the full bath reliable and strong, and they tend to lack the style and care of décor that we lend to kitchen sinks or other quick wash areas. Half-baths linger in mediocrity, unloved and uninspired. It's time to change that. If you've got a half-bath in need of rejuvenation, now's the time to show it you care. Consider some of these great themes that'll help make your half-bath feel like an essential part of the home. 1. Rustic outhouse. 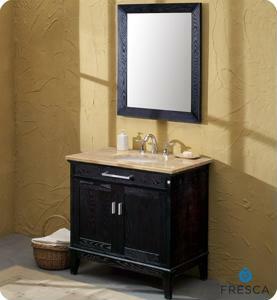 All the charm with none of the gross sanitation issues - going rustic in your half-bath means laying down hardwood floors and giving your vanity a rough-hewn look. Paint your walls a deep fir-tree green to capture the cozy quality of northern forests. Best of all, consider adopting that iconic bit of outhouse door design - the crescent moon insignia. If you're of the opinion that outhouses lack charm to begin with, think of it as country-style and you'll be satisfied. 2. Posh powder room. Avoid giving your half-bath a complex with Napoleon-era décor and instead look to another French ruler who was both longer reigning and less vertically challenged - Louis XIV. Marked by aristocratic splendor and attention to nuance and detail, a powder room according to Louis XIV design will be a lavish mix of marble and gold trim. Wherever there's space, fit an extra bronze or shimmering gold fleur de lis, and don't forget the chandelier! 3. Art nouveau toilette. Jump ahead in European history and you'll land in this stylish and artful period of interior design. Notable for the best use of wrought iron to come out of France and those swirling smoke-like tangles of floral brocade, the art nouveau style is sure to please your half-bath. Consider stained glass in the windows, elegant curves on your fixtures and at least four or five Mucha prints of beautifully illustrated women advertising 19th-century beauty products lining your walls. 4. Contemporary half-bath. If you've ever been in a modern or contemporary style room, you probably felt like it was more of a glimpse of the future than the names imply. Go this route in your half-bath for some straight-lined and forward-thinking design. Stay square, simple and spacious, with plenty of glass and a stylish eco-friendly toilet.